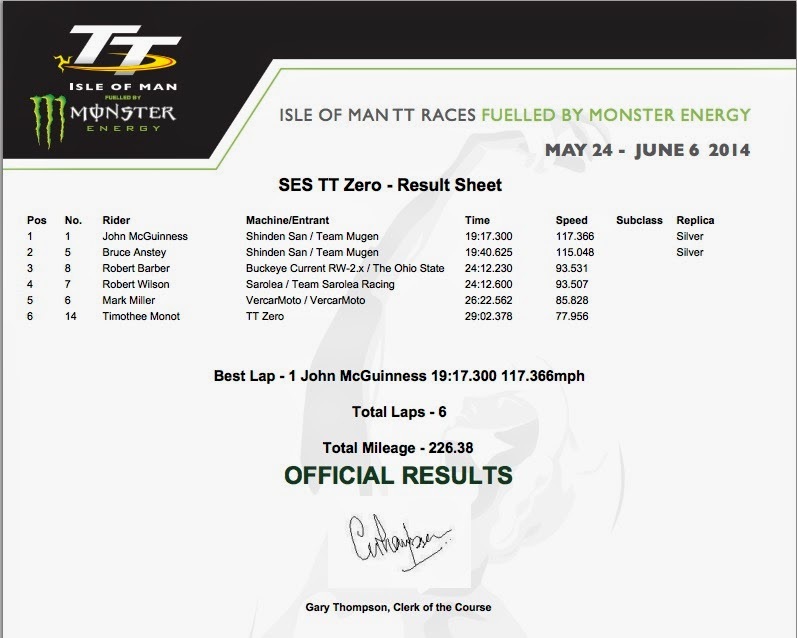 Mugen shattered lap speed records in the 2014 TT ZERO, with John McGuinness (117.366 miles/hr) and Bruce Anstey (115.048 miles/hr) taking 1st and 2nd place. They were the expected winners, and a 115+ miles/hr finish was to be expected after McGuinness' 115.598 finish on Monday, but hitting a speed over 117 miles/hr was beyond expectations. The battle for 3rd place saw a photo finish between Robert Barber (Buckeye Current) and Robert Wilson (Sarolea), with Barber finishing .3 seconds faster than Wilson to take the podium with a 93.531 miles/hr lap speed. Both McGuinness and Anstey set a faster pace at every sector than during practice. At Ballaugh Bridge, McGuinness had a 123.749 miles/hr lap speed versus 122.701 on Monday, and Anstey had a 121.482 miles/hr lap speed versus 120.620 on Monday. At the Ramsey Hairpin, McGuinness had a 128.263 miles/hr lap speed versus 127.344 on Monday, and Anstey had a 126.190 miles/hr lap speed versus 125.074 on Monday. At the top of the mountain (Bungalow), McGuinness had a 124.871 miles/hr lap speed versus 123.308 on Monday, and Anstey had a 122.443 miles/hr lap speed versus 121.271 on Monday. At the finish line it was McGuinness first, 117.366 miles/hr (19:17.300) and Anstey second, 115.048 miles/hr (19:40.625). We've been watching 3rd place all week to see who would take the other spot on the podium. On Friday, Rob Barber took 3rd in practice. But battery pack issues forced the Buckeye Current team to redesign their battery pack field in the field and they weren't able to enter either qualifying round in-between. Sarolea's Rob Wilson took 3rd in both qualifying rounds, turning in times faster than what Barber did on Friday. That meant we'd be seeing a close finish between these teams, but we didn't know how close. The finish was so close to cause confusion at the finish line. At first the Manx Radio announcer told Sarolea they'd taken 3rd place. That would have been stunning for Sarolea to take a podium spot on their first showing at TT ZERO. But, race officials closely studied the results and determined that Barber had finished .3 seconds faster than Sarolea to take the 3rd place podium spot for the Buckeye Current team. Thank you to @iom_tt for a great event. #Sarolea, we had an excellent race and hope to see you next year! Barber's 93.531 miles/hr lap speed was a jump over his 2013 90 miles/hr lap speed. But, was it significantly faster? In the 2010 TT ZERO, Mark Miller (riding then for MotoCzysz) had a 98.820 miles/hr lap speed, and Barber (riding then for Agni Motors) had an 89.290 miles/hr lap speed. Russ Mountford (ARC EV Engineering), George Spence (Kingston Univ ION Horse) and Paul Owen (Brunel) had to retire from the race early. An interesting tidbit is that this makes John McGuinness's first win in the TT ZERO, but his 21st career win at the TT. His lap speed today was faster than his first win at the TT, in the 1999 250cc Lightweight TT. The tremendous jump in top lap speed from 2013 to 2014 is stunning, a nearly 8 miles/hr improvement. We should recognize that it's only the top bikes seeing this rate of improvement. The teams in the 2nd tier gave results not significantly different than previous years. What's different? Deep pockets, and the Mission Motors secret sauce on-board the Mugen bikes. Even so, one wonders what the results would have been had MotoCzysz been able to enter this year (the best of health to Michael Czysz). Here's a few tweets with which to ponder that thought. @die996 @iom_tt @MUGENSHINDENTT Yip, you're right, but it shows what's possible. Even just the speed of development since TT Zero started. Carl Fogarty did 118mph to win in 1990! 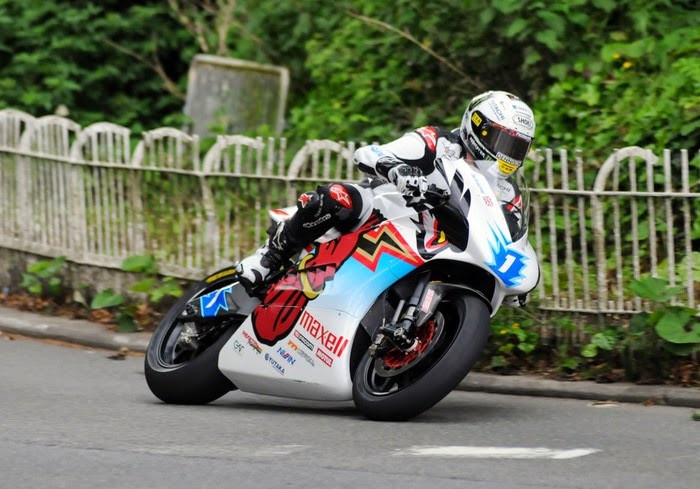 "@PhillipMcCallen: #iomtt TT Zero - 1st John McGuinness 21 TT Wins! @jm130tt http://t.co/Byl4auAjVQ"